APRIL's screening we are back at Coast cafe. The film tells the story of a disparate group of WW2 Italian soldiers who are sent to occupy a small remote Greek island, where the war becomes a distant memory. As time passes, the soldiers gradually shed their military defences and reveal who they really are and what they really want from life. Each with a different past and a different dream to chase. Whilst living on this remote Greek idyll, this unlikely group of comrades become a close bunch of firm friends who learn more about the futility and absurdity of war there than fighting on the front line. Alongside the heart warming human stories there is an underlining comment on the state of the Italian fascistic dream of a bright new future. A future that was never to be. A disarmingly powerful anti-war, anti-fascist film which warms the heart, sparks the imagination and gives food for thought. 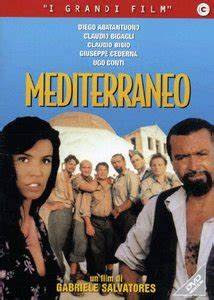 With great characterisations and unforgettable landscapes, Mediterraneo is multi-layered in its simple storytelling. Not to be missed! Remember if you are a member of the film club, then you will be able to come for free, alas no reduced prices for members' guests now so all the more reason to join! Non members all tickets: £4 each. Membership costs £25 for the year which entitles to free entries to 12 screening in the year, 9 at Coast and 3 at the Connaught. You also gain access to our extensive DVD library; entry to our fabulous Christmas party as well as given priority over booking any WFC outside event. Want to become a member of Worthing Film Club? Come along and join at one of our screenings!